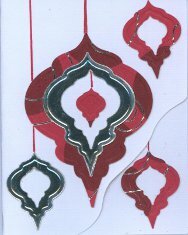 Due to a late start with my cards, I came up with this simple design using the Spellbinders Nestabilities Heirloom Ornaments 2010. 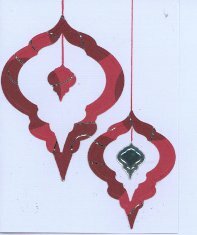 There are 5 sizes of ornaments, so I cut a bunch from some Silver Foil Cardstock and from a print Red & Silver paper called Red Swirl from Imaginations. After cutting them, I glued each individual piece at random, some nested, some by themselves, and used a Metallic Spica marker to draw the ribbon hangers. For some of the cards, I cut the front corner off and put another ornament on the inside so it would peek through. I have also used wrapping paper in Holiday colors to cut out images to use on the fronts of Christmas cards. I am also a scrapbooker, so I usually use scraps for my cards, but since I don't have to worry about using acid=free, lignin-free products with my cards, they don't necessarily have to be scrapbook safe. Therefore wrapping paper or even old wall paper samples are good to use for Holiday cards of all kinds. These are simple and fast. This is a great way to use up scraps left from Scrapbooking, but also think about using Older Christmas Cards from years gone by. And don't forget the envelope liners from cards as well for some foil accents. The individual pieces or the backgrounds can also be Chalked or Painted, or sprayed with Glimmer Mist. Or, using some double sided tape applied as a border and then add glitter to match the colors in your ornaments.